One of my favorite books is Robert Pirsig’s classic, Zen and the Art of Motorcycle Maintenance: An Inquiry Into Values. In it Pirsig states that many times when we are faced with what appears to be a dilemma, a choice between two mutually-exclusive paths in which neither is optimal, the best course of action is to reject the dilemma and choose a third path. 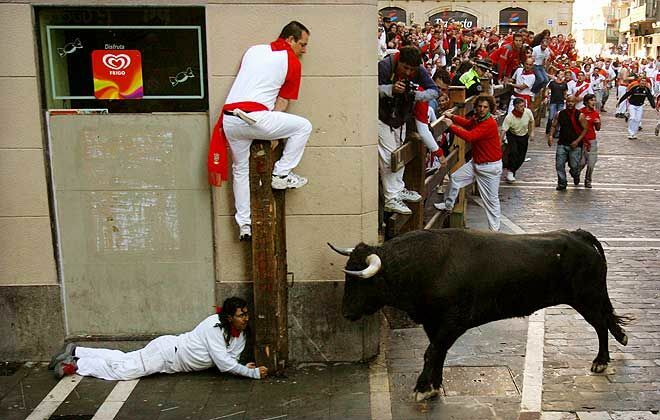 As he says, if you are face to face with an angry bull and given the choice of being gored by either the left horn or the right, choose neither. Choose instead to punch the bull between the eyes, or perhaps lull it to sleep, or come up with a better plan in the moment. Choose anything but one of the offered paths that is certain to end in a bad outcome. 1. STEM workers and those who understand planned obsolescence can advocate for meaningful changes to the way high-potential talent is managed in their companies. This is not an easy task, and success is far from guaranteed, but the probability of successfully instigating and even leading this change is greater than zero. 2. High-potential STEM workers can seek out new employers who have a culture that is more conducive to sustainable growth in both responsibility and rewards. This search is much more easily accomplished when it is planned in advance and not done under duress. A change of employment can be difficult, even life-altering in the short run, but if done well it will be a tremendous benefit over time. 3. All STEM workers can invest proactively in training, many times courtesy of their employers, to round out their skills in areas that will enable them to succeed in adjacent and potentially lucrative career paths like marketing, product management, sales, business development, and entrepreneurship. STEM graduates are particularly well-suited for many of these due to the rigorous education they have already completed. Training for a new function is not always a matter of going back to graduate school, rather acquiring the right mix of knowledge, practice, and coaching to succeed in navigating a planned step into an adjacent career path. What do you think? Share your insights below. Very well-written article, Zach. As a STEM worker, I agree one-hundred percent with what you’ve written here. As a “high potential” (in my own estimation) STEM worker I’ve “topped out” at multiple companies in the past but have so far been able to move on to more appreciative employers. I am (perhaps foolishly) optimistic that I will be able to continue to keep myself in high demand by moving on to newer and more useful technologies as the landscape changes, but even then I’m not likely to get much more than I’m currently making. The only other way I can see myself continuing to get significant raises is if I save my employer a lot of money and they reward my contributions by giving me a decent portion of the saved money. This would require them recognizing my efforts, being able to evaluate in a clear way how much money I saved/made them, and acknowledging the benefits of rewarding my hard work. I think the odds of that happening are quite low. Thanks for sharing your experience, Jake. I agree, it’s awfully hard to have a conversation about “pay for performance” in STEM fields unless you happen to work for a hedge fund. Some companies do seem to understand how to reward high-potential talent, and in most cases this involves equity. But you’re right, it can be hard for one superstar to bend the will of the organization when it comes to rewards. It’s easier to move on or to change functions. A salesperson once complained to a colleague of mine that she was having a lousy year and wouldn’t make more than a certain amount — which happened to be twice what my colleague was making. Perversely, he was the one responsible for supporting her success. Demotivating experiences like this are what accelerate high-potential STEM graduates’ transitions into jobs where they see their compensation more closely aligned with their contributions. And everyone ends up losing to some degree as a result. In my opinion, this whole game of chasing after higher compensation is silly. No matter how hard you work, how many technologies you study, no matter whether you go into management or not, you’re never in your entire life going to make what the CEO’s and their cronies in the financial sector make in just one year alone. Once an intelligent person realizes they’re in a no-win situation, they may eventually come to the conclusion that the way out is to stop playing by their rules. Profit = Income – Expenses. The first step is to recognize that reducing expenses produces the same end result as achieving a higher compensation at work. In fact, increasing your yearly income produces diminishing returns on investment due to increasing tax rates. You are an engineer and technology is your salvation. Find your biggest ongoing expense and figure out how to reduce and/or eliminate it. Rinse and repeat until you’ve completely squeezed all you can out of the Profit equation. Examples: Install a solar hot water heater to shutoff natural gas service to the house. A few more years down the road, install solar electricity. Install a well for water. Install a septic system for sewage. Turn off cable TV service and use free over the air HDTV. Turn off phone service and use free Voice Over IP instead. Growva fruit/vegetable garden to stop paying for produce and gasoline to go to the store every week. Shutoff trash service by composting and recycling all of your waste. If you make it down this path far enough, you will eventually get to a point where your ongoing expenses are so low that you begin to question whether you even need to go to work. And that’s when you realize that the CEO’s, financial cronies, and the gov’t they control are going to claim you’re a domestic terrorist and/or drug dealer to keep this idea from spreading to other wage slaves. So you find a seasonal job where you only work half a year and lay low the rest of the time. Ed, good to hear from you. Thanks for reading and for sharing your thoughts. I agree that the pursuit of wealth alone is fruitless and unfulfilling, that many CEOs and people working in the financial sector are grossly overpaid, and that most people would be better off consuming less and spending less money. I struggle with recommending a minimalist or off-the-grid lifestyle, though, due to the fallacy of composition. The effects would be massively deflationary at scale. Instead, I’d prefer to empower those who are getting the work done to claim a greater share of the value they create. We have too many thoughtful, creative people who are in jobs that don’t allow them to be innovative, and I think that hurts all of us — even the overpaid CEOs — in the long run. Great article Zach! Industry needs to shape the educational system to what it needs or we need to shift to an apprenticeship system of some kind… Cost of education has to go down and compensation up if we want to compete with other industries like financial services and law. If you can’t change the culture and reward system create your own. Thanks for reading, Jared! I am a big fan of apprenticeships, they complement the university experience in so many ways. And I think you’re right about the financial incentives for engineering and technical work needing to improve. The disconnect between compensation and value creation is just staggering. Thought provoking. Zach, how would you classify your current position using the Appendix A5 – Technology (http://cis.org/sites/cis.org/files/stem-a5-1.jpg) from the article cited in your introduction? David, thanks for reading. The table you cite, if I’m not mistaken, illustrates where people who leave Technology (i.e. 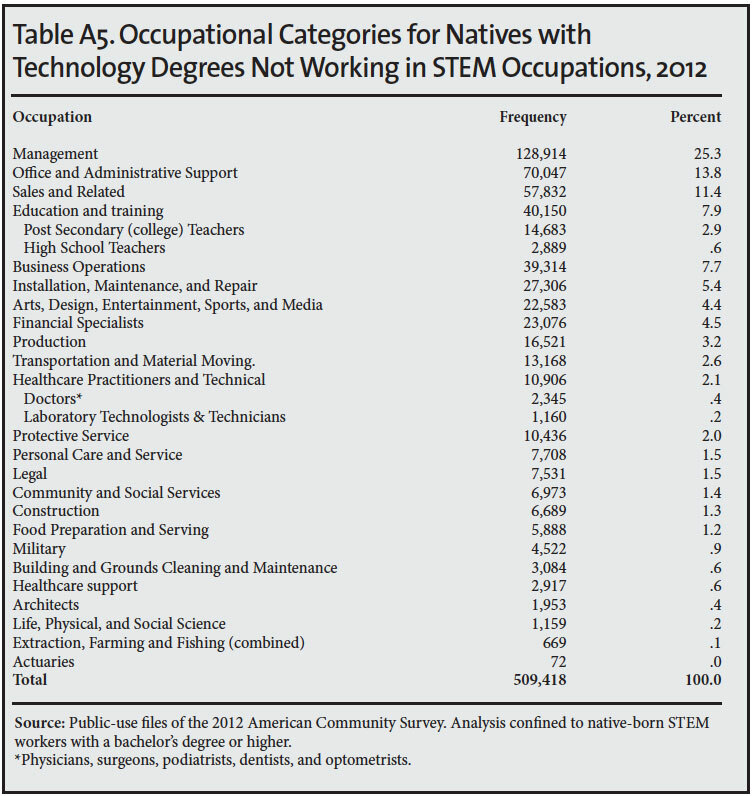 how computer science, programming, and related jobs are classified in the STEM nomenclature) jobs end up landing. At first glance, it looks like a little more than half of those who leave Technology end up in management (though not within R&D, those are still considered STEM jobs by the study), administration, or sales. And I think this makes sense, these jobs will generally allow engineers who have hit the salary ceiling to access more lucrative compensation plans. There are a few other job categories (medicine, law, finance) that also feature this type of salary upside, but from the data cited there are not many former engineers who follow those paths. It is interesting to note, though, that the “long tail” of job categories where ~40% of former engineers end up seem to be service jobs with lower compensation than engineering. If so, you might consider these engineers to be among the group who don’t hit the salary ceiling until late enough in their careers that they are likely to end up either unemployed or in a lower-paying job.